Was able to view the wedding picture in real life this weekend. After seeing the photo, I was so excited to see it, and it is truly stunning and the detail is absolutely amazing. Her painting style is so beautiful, I feel honored to be the subject. The blues of the wedding theme are complimented so well by the purples and pinks in the background and considering it is a view from the back she has managed to capture an amazing likeness. 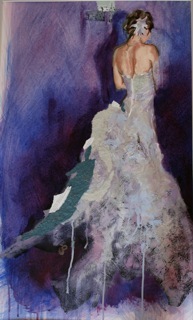 The rough textures of the oils brilliantly captures the layers and movement of the dress. I love that she has used bits of our flowers and the order of service adding to the layering and totally representing the style of the wedding. The piece is so wonderful on so many levels. It is beautiful and interesting to look at from so many views. I could spend hours just gazing at it and still see new elements each time I do. It is such a wonderful gift and I know my parents are just over the moon. A huge thanks again to the wonderful Jas Peacham, you are one very, very talented lady and I am majorly full of awe! Following the wedding of our beautiful friends on a gorgeous day in May up in Northumberland I have just handed over my latest creation to complete the wedding package, a handmade, bespoke wedding album made with love. The album is Coptic bound so that it opens fully out allowing for optimum viewing and large double spread images. It also can be left open on the coffee table for prolonged reminiscing over wonderful memories. I used a grey thread to bind the album and completed the album with a hardback cover in purple paper both in theme with the wedding colours. As a finishing touch a simple title debossed into the cover using the press. They are such a lovely couple and I hugely enjoyed creating the album reliving wonderful moments of a truly special day. I hope they adore it as much as I do and I wish them all the best as Mr and Mrs!